Whether you’ve bought a new Rolex in a jewelry store or if you’ve got a rose gold watch that you have always wanted to have, you’ll probably want to enjoy it for a while. Maintenance is essential to keep your watch in good condition. Keep reading to learn some tips and tricks to help keep your watch in good condition for a long time. Starting with the obvious: a mechanical watch is usually not made to play tennis or to visit a sauna. To keep your watch safe and sound, be careful with water (sailing or dancing in the rain), shocks and blows (which your watch risks during a good football game), large temperature changes (not take your watch in a sauna and, preferably, not when you sunbathe). The leather bracelets are not only sensitive to water, but also to the perfumes that are worn on the wrist and the drops of fat that can come from the food you drink. Not everyone buys a watch to take it: there are those who collect them, and others who like to reserve the watch for a very special occasion. In this case, it is even more important to pay close attention to how the watch is stored. Keep it safe in a dry, dark environment with a controlled temperature. Moisture can cause the movement to rust while light can cause discoloration. Interestingly, light is not always a bad guy. In some rare cases, like it is with Rolex, discoloration can make a watch more desirable. That specific patina could add value to some watches, but in most cases the best thing is, by far, to keep your valuable watch away from the light. The original case of the watch is often a good place to store it. To keep a watch in good condition, you can clean the box gently using a soft toothbrush and some water. The leather bracelet will remain soft and flexible if wax is regularly applied. Keep the movement running. If you do not plan to wear your watch frequently, wind it daily to make sure that the oil does not drip out or the gears get stuck. However, you should also give the opportunity of your watch spring to release its tension. A winding case can help wind the automatic watches by moving the watch in such a way that human movement is simulated, thus activating the automatic rope mechanism without winding it excessively. Do not adjust the date of your mechanical watch between 9 pm and 3 am, as it can interfere with the mechanical date change and damage the watch. 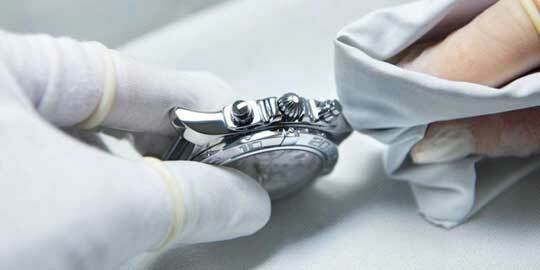 Last but not least, make sure a specialist checks your watch every few years, even if it looks like it is in good shape. A specialist can see what part of your watch needs a set-up, and prevent it from breaking or having problems later. Always inform a specialist or the maker of the watch if you do not want to change, polish or adjust certain parts of your watch. While a regular review is necessary to keep your watch running smoothly, sometimes extra maintenance is necessary. Check the glass of your watch from time to time for its damage and be alert for condensation in it.